Other bloggers (Old NFO and the Lone Star Parson to name two) have posted up meals that they've created recently. In LSP's case, it's field to table with his kills/catches. In my case, it's cracking open the Hickory Farms gift basket that I received for Christmas, twisting open a mini-flask of A&W Root Beer and carving things up with my knife. 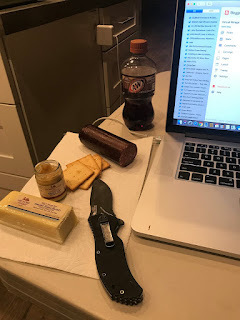 Beef summer sausage, Swiss Cheese (without holes in it - riddle me that one), sweet mustard, crackers and a knife is all you need to have a mini-feast for breakfast while blogging in the hovel at the White Wolf Mine. On the menu for lunch is an opened can of Campbell's tomato soup, blended with milk and heated to taste along with a slice of cheese between two slabs of bread, cooked to a golden brown. Yes, the grilled cheese will be dipped into the soup. Dinner will be a baked potato with butter, sour cream, chives and bacon. I'm also going to tear some lettuce and throw tomatoes on it to help balance the whole thing out. You're saying to yourself, "If I was staying there, I'd sneak out and drive through somewhere." While that may sound doable in your neighborhood, it doesn't work here. The NEXT closest food is a two hour round trip drive away, so you eat from the Officer's Table at the mine, or you starve. Does that baked potato with the crispy skin rubbed with salt sound better now? Daughters and grandchildren arrive tomorrow. The quartermaster laid in supplies for their fare as well, with their little preferences baked into the menu. By then, I will have nibbled my way through the cheese and summer sausage. Germany announced that it will begin to push for the EU to have a permanent seat on the UN Security Council. Maybe they should give up their seat on the UN Security Council (their two year term as a temporary member begins this year)? Personally I find the UN to be a complete waste of time, money and space, and being an American nationalist, I don't think that I want to give up one inch of national sovereignty to the UN. I don't care what the EU does. The British were correct to vote for BREXIT. The French look to be heading for a change of government that might even push for FREXIT. NATO became a European scam to have the US contribute to their national defense, while not seeing to their own needs. Germany is a hollow shell militarily, their navy is a EuroJoke. Yeah, that's how I see it. (LINK) Read more at the link about Weewarrasaurus pobeni. 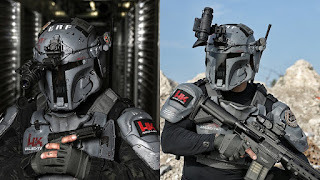 When you consider that we left 5 base camps there fifty years ago, we have more claim on the Moon than the Chinese had on the South China Sea before they started constructing bases on reefs. 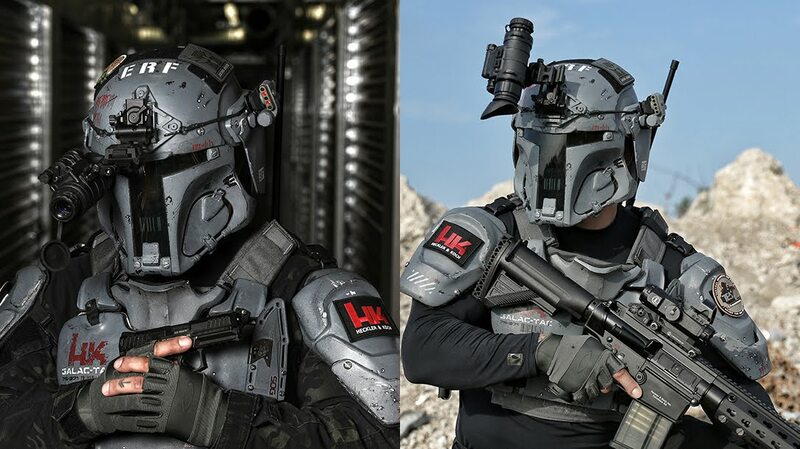 I have a Starship Troopers classroom scenario running in my head for some reason. Sometimes it's interesting to stop and reflect on how the US relates to other nations in terms of GDP. Read about it HERE. Even though the socialist system is alive and well in California, it's not as evolved as it is in Great Britain. America’s largest state economy is California, which produced $2.75 trillion of economic output in 2017, more than the United Kingdom’s GDP last year of $2.62 trillion. Consider this: California has a labor force of 19.3 million compared to the labor force in the UK of 33.8 million (World Bank data here). It required a labor force 75% larger (and 14.5 million more people) in the UK to produce the same economic output last year as California. California as a separate country would have been the 5th largest economy in the world last year, ahead of the UK ($2.62 trillion), India ($2.61 trillion) and France ($2.58 trillion). Senator Mitt Romney (R-UT) lost to Barack. Some say that he didn't try hard enough. He's been trying hard to take shots at President Trump from some sort of faux moral high ground that he occupies. I voted for him once. TODAY, I wouldn't vote for him as city dog catcher in Bayonne, NJ (or any other city).